All Set for the Polls in India? If there was any doubt about the possibility of an early general election in India, last Friday's union budget has removed it. 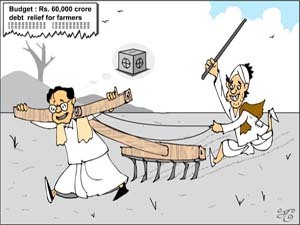 The display of massive populist profligacy in the budget, which is evident in the writing off of Rs.60,000 crore ($15 billion) of farmers' loans along with sharp cuts in income-tax rates, are tell-tale signs of a poll later this year. True, there are a few hurdles yet to be crossed. Perhaps the biggest of them is the nuclear deal, which is vehemently opposed by the Left. But even in this field, there are indications that the government's talks with the International Atomic Energy Agency (IAEA) are moving forward satisfactorily and that it will be possible before long to take the next step towards clinching the deal. As is known, any such initiative will make the Left withdraw its support to the government, thereby presaging its fall. But, for once, the ruling Congress seems to have acted with uncharacteristic cleverness on the matter. In fact, it is not impossible that it deliberately dragged out the nuclear talks, thereby lulling the Left and even some of its reluctant allies like the Nationalist Congress Party (NCP) and the Rashtriya Janata Dal (RJD) into a false sense of security. But the government's tactic apparently was that it would carry on the talks till it was able to present its please-all budget. Had it acted hastily, as when Prime Minister Manmohan Singh made his peremptory take-it-or-leave-it offer to the Left on the deal in a newspaper interview last December, the communists would have walked out. And, as External Affairs Minister Pranab Mukherjee pointed out, no one would have then signed a pact with a minority government. But, now, having presented a budget which would please the farmers as well as the middle class, the ruling Congress has ensured that it can face the electorate with much greater confidence than before. What is more, for the Left to withdraw support when the government has rolled out such a generous package for the farmers will only make the comrades look rather silly. But even more than the budget, it is the possible signing of the nuclear deal, which may well prove to be the icing on the cake for the ruling dispensation. For it will further consolidate its hold on the middle class, which it may have already won over with its raising of the income-tax slab to Rs.150,000 and for senior citizens to Rs.225,000 per year. What may have persuaded the government to act positively on the deal is the feedback it apparently received to the effect that the Bharatiya Janata Party's (BJP) band of overseas supporters, especially in the US, are unhappy with the party's cussedness with regard to the measure. Besides, it is no secret that vast sections of the middle and upper classes in India are in favour of the deal along with what it entails about increasing proximity to the US. It is only the committed Leftists and a few strategic experts with their mindset still attuned to the Cold War who are against it. It will be presumptuous to predict that the budget and the deal will enable the Congress and its allies to cross the electoral Rubicon. For, although the budget represents good politics, it is bad economics in the sense that it is a typical, "socialistic" spendthrift measure, which blithely ignores fiscal prudence. For one, it will make a mockery of the institutional lending system to the horror of all practical-minded bankers. For another, it will make fools of those who take care to repay their loans. What has also to be taken into consideration is that a sizeable percentage of farmers take loans from the traditional moneylenders as well as from relatives and friends. As such, they will be outside the scope of the largesse, offered by the government. There is no certainty, therefore, that the spate of farmers' suicides will register a drop. However, even if economists carp at the government's extravagance, it has to he remembered that the farmers' lobby has always been an influential one in India because of the predominantly rural bias of the economy. As such, sops such as free electricity and subsidized fertilizers, among other things, have always been a part of the policies of all governments, irrespective of their political hues. Besides, the latest gesture was unavoidable for two reasons. One was the extremely unfortunate high rate of suicides by farmers, which had both a stunning as well as bewildering effect on the country as a whole if only because it was difficult to understand why people were being driven to take their own lives in such large numbers. The second reason was the continuing belief that economic reforms benefited only the rich and that the government was not serious about ensuring that the fruits of the high growth rate percolated down to the bottom. Given such perceptions, it was unavoidable for the government to take one step back, as it were, after taking two steps forward with its market-oriented policies, and spread a bit of cheer in an otherwise gloomy countryside. Having done so, however, it has no option but to advance the date of the polls for, otherwise, all its efforts to win friends and influence people will be in vain.